It's time to plan your Halloween festivities. Of course New Orleans is famous for Mardi Gras, but Halloween is another holiday we do well. With parades, haunted houses and fun for the little ones, there are always plenty of ways to get spooked in October. Here are a few events we recommend. House of Shock Haunted House and Festival. For those who like to be scared, the House of Shock Haunted House and Festival is a popular Halloween attraction. Entrance to the haunted house costs $25 or $50 for VIP admission (VIP admission lets you skip the line). If you’re not a haunted house fan, you can still hang out in the festival area, which includes live music and “circus-style” entertainment, such as fire breathers. Festival admission is free, but keep in mind the festival atmosphere may be too scary for little kids. One special event happening at House of Shock this year will be the wedding of Megan Adair and Chris Guillot of Bourg, La. The couple had their first date at House of Shock, so it’s fitting that they will be married there on Halloween night. While the couple’s families will be in attendance, the wedding is open to the public and there will be a pyrotechnic display after the “I do’s.” Ordained minister Rev. B. Dangerous will marry the couple. House of Shock is open Fridays and Saturdays in October. Closer to Halloween it is open Fri., Oct. 25, through Sun., Oct. 27, and Wed., Oct. 30, through Fri., Nov. 1. House of Shock is located at 319 Butterworth St. in Jefferson, La. The Mortuary Haunted House An old mansion and funeral home built in 1872, the Haunted Mortuary bills itself as “a haunted house in a real haunted house.” Around Halloween the Mid-City mansion transforms into a top-rate haunted house. Each year has a different theme and this year’s is the “Zombie Outbreak,” where zombies have taken over New Orleans. Tickets cost $25 for general admission or $35 for “Skip the Line” access. If you plan to visit The Mortuary more than once this season, try the Frequent Fear Season Pass for $88, which gets you unlimited visits during Halloween season. If you want a free VIP pass, you can donate blood at The Blood Center, which parks outside The Mortuary every night the haunted house is open. The Mortuary Haunted House is open Thursday through Sunday for the first three weekends in October, and from Oct. 22 through Oct. 31. On Thursday nights in October (except for Oct. 31), say “I’m Patient Zero” when purchasing your ticket and you’ll receive a $5 discount. The box office opens at 7 p.m. The Mortuary Haunted House is located at 4800 Canal St. and is accessible via streetcar. For New Orleans kids, there are always lots of Halloween activities besides the classic door-to-door trick-or-treating. Ghosts in the Oaks. If your Halloween is focused around your kids or grandkids, Ghosts in the Oaks is a good choice for the little ones. Happening this year on Fri., Oct. 18, and Sat., Oct. 19, the event includes trick-or-treating, crafts, amusement park rides and more kid-centric activities in City Park’s Carousel Gardens Amusement Park and Storyland. Ghosts in the Oaks is a benefit for the Carousel Gardens Amusement Park and Storyland. Tickets cost $20 for early admission and $15 for general admission. Friends of City Park members receive a discount. Early admission ticket-holders can come in at 6 p.m.
Boo at the Zoo. For another night that’s fun for the kids, the Audubon Zoo hosts Boo at the Zoo for two weekends in October. Bring your youngsters to Audubon for trick-or-treating, games, haunted houses and more kid-friendly activities. Boo at the Zoo is happening from 5 p.m. until 9 p.m. Fri., Oct. 18, and Sat., Oct. 19, as well as Fri., Oct. 25, and Sat., Oct. 26, at the Audubon Zoo, located at 6500 Magazine St. Kids from a few months to 12 years old are welcome to attend. Tickets cost $17 per person, but kids younger than one year old get in free. Proceeds from the event will benefit the zoo and Children’s Hospital. Krewe of Boo Parade. Just like every other holiday in New Orleans, there has to be a good parade. For Halloween, there’s the Krewe of Boo Parade, which rolls between 6 p.m. and 6:30 p.m., Sat., Oct. 26, at the corner of Elysian Fields Avenue and Decatur Street. The parade ends at Mardi Gras World with an after party, the Krewe of Boo Spook Fest, which lasts until 2 a.m. For live entertainment, local group Flow Tribe will open for the Brooklyn-based band Pimps of Joytime. Party admission is free for Krewe of Boo members, but non-members are also invited. Tickets to the party cost $25 in advance and $35 at the door. Molly’s at the Market Parade. Another annual parade to look for is Jim Monaghan’s Halloween Parade, which will roll around 6:30 p.m., Thurs., Oct. 31, outside Molly’s At The Market, which is located at 1107 Decatur St.
More details were not available at press time. Check Molly’s at the Market on Facebook for the latest information, or visit the bar’s website. Ghostly Galavant Weekend. 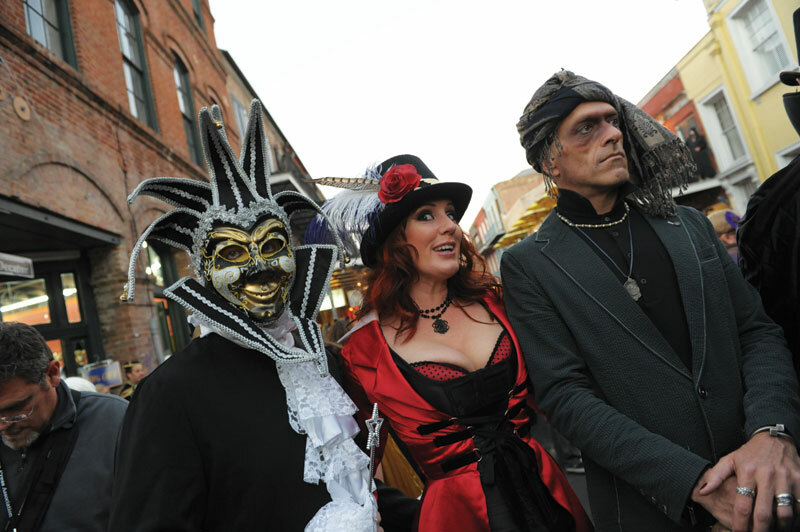 The 27th annual Ghostly Galavant Fundraiser raises money for the Friends of the Cabildo and offers Halloween fans of all ages many chances for a fun weekend. Get a babysitter for the Ghostly Galavant Costume Party, happening at 7:30 p.m., Fri., Oct. 25, at the Cabildo, located at 701 Chartres St. The costume party will feature food from local restaurants, along with beer and wine. Tickets cost $35 in advance and $45 at the door. On Sat., Oct 26, or Sun., Oct. 27, bring the kids to the Cabildo for a spooky tour through the French Quarter. Tours happen every 30 minutes between 10 a.m. and 3 p.m. Tickets cost $20 for adults, $10 for students and kids are free. Proceeds from the gala and the tours will benefit the Friends of the Cabildo, which funds the Louisiana State Museum. The concert will feature music from Alfred Hitchcock’s classic film Psycho. The event is happening at 7:30 p.m., Sat., Oct. 26, at the Mahalia Jackson Theater, located at 1419 Basin St. Tickets range from $20 to $99. As a New Orleanian, you probably have a closet full of costumes, but if you’re looking to mix it up for Halloween this year, these places are good spots to rent an ensemble, have one made or buy a hard-to-find piece.